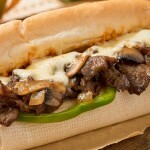 At the core of the M. Robzen Product line is Steaktacular, a Philly Style sandwich steak product. 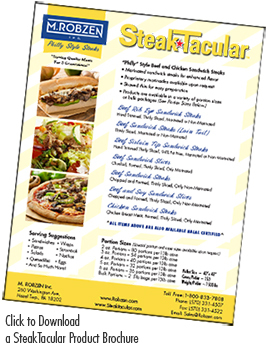 With Steaktacular there are several offerings to chose from from Choice Ribeye steaks, to loin tail steaks, marinated chicken steaks and more. Custom orders can also be arranged using propriety marinades or meat blends. Our products are truly a cut above the rest. We have real butchers at work hand trimming the meats we offer, ensuring you get only the best product available. From there our precision slicers and packers produce cuts to the tightest weight constraints. We can deliver exactly to your specifications every time. We pride ourselves in offering products that go beyond the standard fare. We can work with you to create a product perfectly tailored to your needs. Contact us today to learn more about the private labeling and product development services we offer.